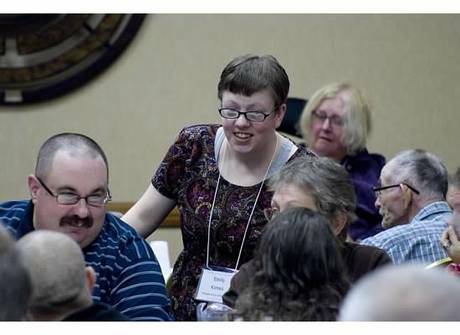 ​People First is the only statewide disability rights organization in Nebraska run by and for people with all types of disabilities. Local chapters meet to learn from each other and practice our advocacy skills. We volunteer to give back to our communities. We tell our elected officials what is important to us. We work with our families, our service providers, and other organizations to build the lives we want. People First of Nebraska is a statewide board made up of elected officers and representatives from all our affiliated chapters. The are supported by volunteer state advisors and administrative support staff. The Board raises funds, provides training and resources to local chapters, and advocates for community inclusion and self-determination for all people with disabilities. People First believes that people with disabilities should be treated as equals and given the same decisions, rights, choices, responsibilities, and chances to speak up and empower themselves. Self-Advocacy means being informed and included in the conversation. It means speaking up for ourselves and being heard when decisions are being made about our lives. Self-Advocacy means making choices about where we live, where we work, what we do for fun, who we share our lives with, how we spend our money, and taking responsibility for those choices. It means we have equal access to all the things that make life good.